Max sent me another bubbleope of cards in early February and I am just now checking these out. I had not seen the "Biography" cards that I can remember! 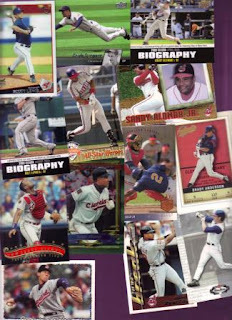 I also like the 'old school' logo in the corner of some of the 2009 Topps. There are a lot of shiny cards, and I likes my shiny like a little kid at Christmas! The standout in the package is the Shin-Soo Choo SweetSpot Swatch card! AWESOME! Thanks, as always, Max!! These are wonderful cards to add to my collection! That thing that Kimaloo do!